WATERTOWN — Maria “Mary” Kausyla, formerly of Naugatuck, passed away Wednesday, July 20, 2016 at her home in Watertown. She was the wife of the late Balys Kausyla. Mrs. Kausyla was born Jan. 20, 1923 in Stakei, Lithuania, the daughter of the late John and Elizabeth (Bruosat) Dregnat. She came to the U.S. in 1948 and made her home in Naugatuck where she raised her family with her husband. 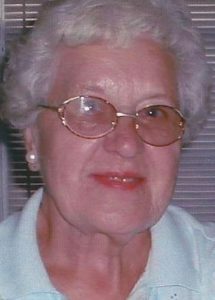 During her years in Naugatuck she worked at Uniroyal Footwear for over 30 years. She enjoyed working outdoors, especially gardening. Her greatest joys were grandchildren and great-grandchildren. She is survived by her sons, Algrid Kausyla of Watertown and Edward Kausyla and his wife Noreen of Litchfield; her grandchildren, David Kausyla of Waterbury, Ingrid Kausyla of Watertown, William Kausyla of Litchfield, and Leslie Maloney and her husband Robert of Torrington; her great-grandchildren, Mario, Oliver, Grace, David, Chelsea, Jane, Jordan; and her great-great grandchildren, Emma and Kurt. Funeral services will be held 10:30 a.m. on Monday, July 25, 2016 from the Alderson-Ford Funeral Home of Naugatuck, 201 Meadow St., to St. Paul’s Lutheran Church, 350 Millville Ave., for a funeral service at 11 a.m. Burial will follow in Grove Cemetery. Calling hours will be held on Monday at the funeral home from 9:30 a.m. until the procession leaves for church. Memorial contributions may be made to St. Paul’s Lutheran Church, 350 Millville Ave., Naugatuck, CT 06770.